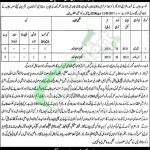 Get Mines and Minerals Department Punjab Jobs 2017 DG Khan Region at this page of our site. A reputed department working under Punjab Government named as Mines and Minerals Department is looking to recruit positions for Office of Deputy Director Mines and Minerals DG Khan Region, for which it invites applications from the DG Khan Domiciled candidates for the following positions such as Chain Man and Naib Qasid). Department has set a separate quota for Government Employees, Females and Disabled persons due to which eligible candidates under these quotas can apply. Candidates wanted to apply for these positions should be at least literate but preference shall be given to candidates holding Matriculation qualification. So, if you are not well educated but wanted to be part of any Government Department then it is a right opportunity for you to cash it and now in the following, we’ll discuss how to apply the procedure for these positions. Applications written on plain paper along with attested copies of educational certificate, diplomas, CNIC, domicile and recent photographs should reach the following address given below. Address: Deputy Director Mines and Minerals Division Complex Railway Road DG Khan.